For the first time these two teams meet as conference rivals. It would be a far more compelling milestone if Colorado had shown any ability whatsoever to play football at any point this season — or this decade, for that matter. Still, it’s the start of a matchup that could become a rivalry at some point. Colorado will be hoping that this new era goes better for them than all the times they met as nonconference opponents — USC has won all five historical meetings. The last meeting was in 2002, though, so we can’t read too much into that past. The first thing to watch in this game will be whether Lane Kiffin has quit whining and started to focus on this game yet. Kiffin was furious at the end of regulation time in his game against Stanford on Saturday. He thought his player had gotten out of bounds with time still on the clock, and he also thought he had called time out with a second left, but the officials disagreed and he was unable to kick the winning field goal. Kiffin blew a gasket at the time, revisited it in his press conference after the loss, and has talked about it to anyone who will listen since. It was a questionable call, but Kiffin’s response was way out of line. The danger here is that he spends too much time focusing on what happened and not enough looking at what is coming up now. Combined with the fact that this is a very underwhelming opponent and this could be an easy game for the Trojans to look past and underperform in if Kiffin isn’t entirely focused. He also needs to make sure that his team doesn’t feel sorry for themselves after a very tough loss to Stanford and let that affect them on the field. His looking back won’t help his team look forward. Colorado has a whole lot of issues to overcome, but the biggest is that someone seems to have stolen both of their lines and replaced them with turnstiles. The offensive line can’t opening running lanes, and has allowed a lot of sacks — both while playing defensive lines smaller and far less athletic than the Trojans have. The defensive line is very week against the run, and allows opposing quarterbacks plenty of time to work. Against a QB like Matt Barkley they can’t really afford to be giving their opponents a lot of time. The defense as a whole is a big concern — they have given up 38.3 points per game, and more than 48 per game in their last four conference games. 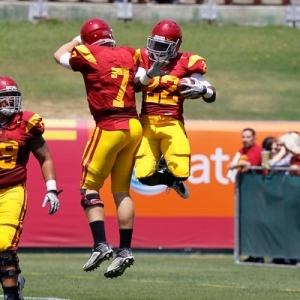 USC is averaging more than 39 points per game in their last four against solid opponents. Colorado’s season has been hit hard by injuries, suspensions, and all sorts of other problems. No single story shows how bad their luck has been better than this: Rodney Stewart, their leading rusher, was hurt two games ago, and was lost for last week. To fill in for his absence they pulled the redshirt of promising freshman Malcolm Creer. Creer was only somewhat effective, but he had little time to show what he could do before suffering MCL and ACL injuries and being lost for the season. That bad luck has had an obvious physical and psychological impact on this team. They look a whole lot like a squad who just wants the misery of the season to end. Head Coach Jon Embree’s motivational skills are going to be sorely tested in the tail end of his first season. USC opened as 21.5 point favorites, and that spread has moved to 22.5 in some spots, according to college football odds. Nearly 85 percent of bets have been on the Trojans, so there is no danger of the line moving to or below the key number of 21 unless something strange happens. The total opened at 56.5 and has been steady in early betting action. USC is 7-2 ATS in their last nine road games. Colorado is just 5-16 ATS in their last 21 conference games, though that futility is spread over two different conferences. I hate big spreads like this one, but I can’t think of a single compelling reason to back the Buffs in this one. USC is playing with confidence on both sides of the ball. There’s a chance that they could quit after that Stanford loss, but Barkley is a proud guy, and I expect him instead to come out fired up in this and looking for whatever revenge he can get. If USC plays like they can — or even close — then there is nothing at all that Colorado can do to stop or match them. In their last four Colorado has lost to Arizona State by 34, Oregon by 43, Washington by 28, and Stanford by 41. I can’t see how they will suddenly figure out how to play a good team close, and last week USC showed that they are at least competitive with the best of the Pac-12. I expect USC to roll in this one.